Notre Dame has been – and still is – recruiting 2020 Arizona offensive lineman Tosh Baker‍ hard. 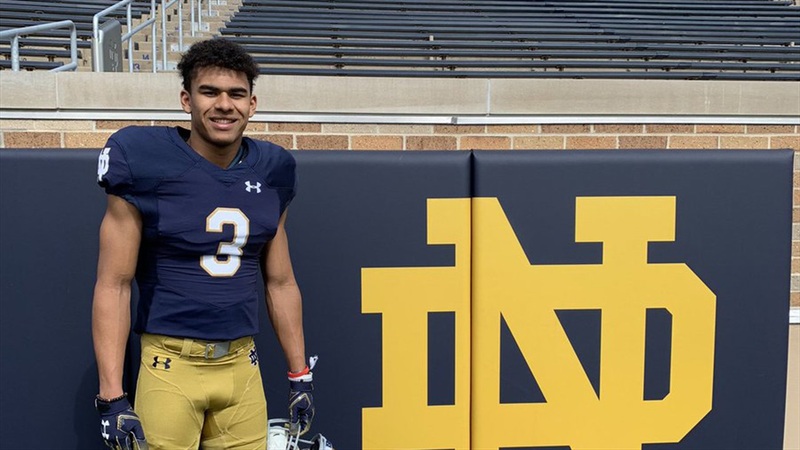 During the Irish’s pursuit of Baker, they came across another potential prospect, 2020 Pinnacle High School wide receiver Marcus Libman‍. The 6-foot-1, 175-pounder from Phoenix was in South Bend earlier this week for an unofficial visit. “The visit first came about when (wide receivers coach Del) Alexander came to Tosh and I’s basketball game,” Libman explained. “He said we should come down sometime. While in South Bend, Libman had the chance to get a look inside the school and the program. “I got to meet all the coaches, build relationships, and visit the campus and football facility,” he told Irish Sports Daily. “The most impressive thing to me was how important winning was to them and to always be great. He spoke with all of the coaches, but spent most of his time with Alexander. “Our conversation was very strong and he has lots of great knowledge,” Libman said of Alexander. Libman said Alexander is set to come out to Pinnacle this spring to catch a practice. Libman currently has an offer from Cornell and is also receiving interest from several other schools, including Arizona, Arizona State, USC, UCLA, Cal, Princeton and Harvard. “Recently, I have visited UCLA and USC and next I’ll be at Princeton and Harvard over there in the summer,” he said. He’s looking for a blend of athletics and academics in a college.